I have had this from my first born and Iv tried multiple pushchairs across the two children but this is by far one of my favourites. Its so easy to push. It feels super sturdy and it is easy to put up and down one handed. My children both seem very comfortable in there. Its lasted through both my children and im still using it with my second and its still got loads of life left. Iv used it on multiple terrain and its one of the best for this. The wheels dont seem phased but much. Theres good suspension so was good on rocky terrain too. I would definitely recommend for any first time mum. The travel system features are also fab. The car seats just click in nicely and the carrycot is the sturdiest and most well built iv seen even amongst the most expensive brands. This buggy is very good in a cheaper branded buggy. Its easy to steer especially with one hand. Folding the buggy can be a little tricky. This buggy is very good for a cheaper branded buggy, so you can feel like you have got a bargain and the same quality as a more expensive one. It feels like it's built well and will last for many years. It's easy to steer and you can in fact steer with 1 hand if needed. The downside of this product is sometimes it's a little hard to fold. And also the frame is very big so you need a bigish car for it to fit in. 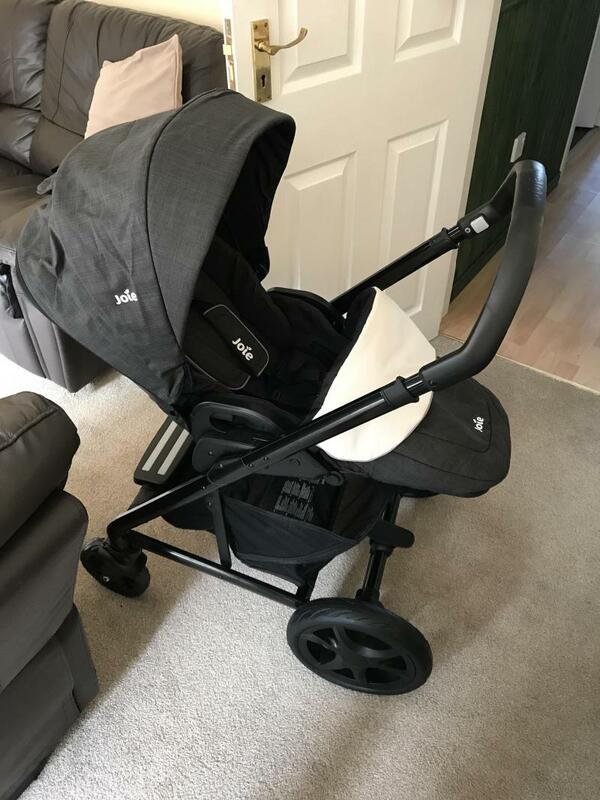 This is a great pushchair for a first time mum, it's easy to fold and fit into a small car boots which make it easier to get out the house, it's also compatible with some car seats (I use it with the igemm) which is another plus point. 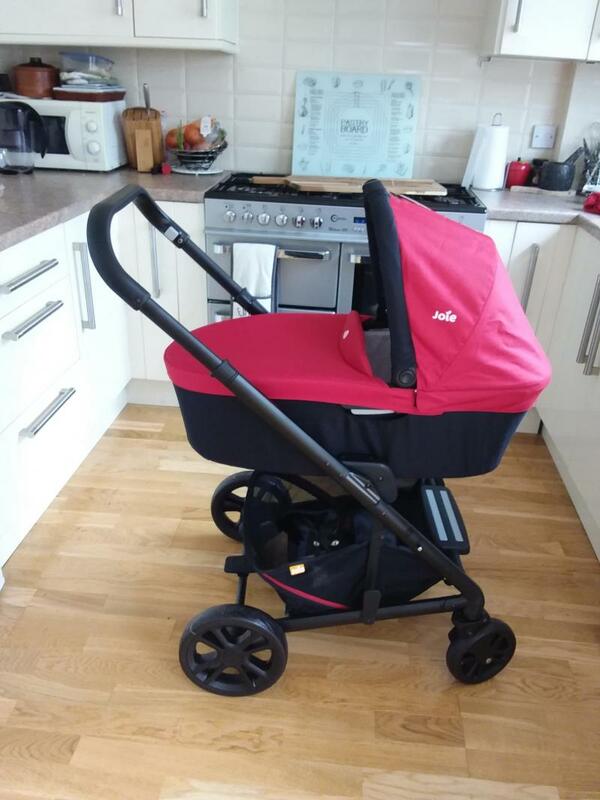 I've used the pushchair with the carrycot which looks very nice when your out and about, however the pushchair is much bigger with the carrycot fitted. It’s compact & very easy to fold up & down. This travel system is perfect in every way! Can’t fault anything with it at all it’s very compact when folding down to put in the car. Very easy to put up & down too! Slimline compared to many of the other travel systems. Love this pram, easy to steer and lightweight. Very good travel system for getting in and out of the car as more slimline than many other travel systems. Seat easily reclines and the foot section can be altered as they get older. Good size basket underneath. Easy to fold down and put up. Lightweight and can be steered easily. The footmuff came off when attached using the magnets inside. So light & plenty of space underneath, makes shopping with a baby super easy. It’s starting to creak a bit when moving. I completely love this pushchair. It’s so easy to put up and fold - very easy to store away when you live in a small place like me! 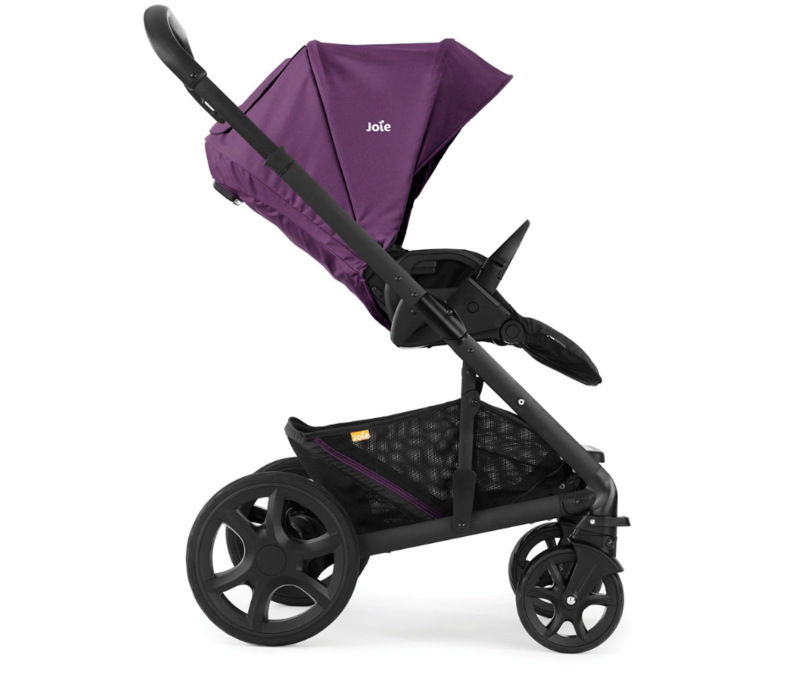 The big wheels make it easy to use for walks in the park and to control the buggy. The adjustable handle is great and again, so easy to do. There is nothing strenuous about this pushchair. What you see is what you get! The Carry is nice and spacious & the car seat part is super light! I had my eye in this travel system for a while whilst pregnant and it does not disappoint. Quality is really good and price is amazing. It's lightweight, easy to steer and get in and out of the car. Slightly annoying that you need adapters for the car seat and it is slightly creaky but other than that it is a good all round travel system. 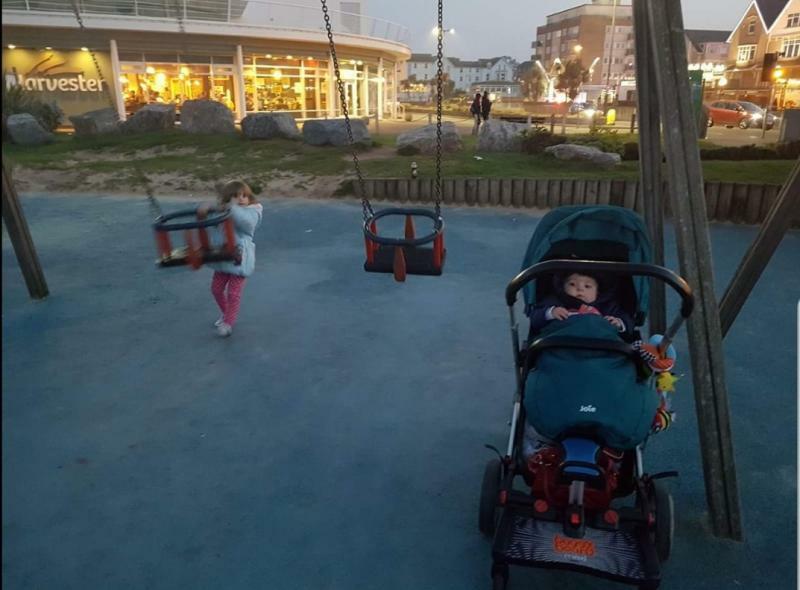 Light, easy to collapse, great first parents pushchair. Grrat that this comes as a full travel system covering birth to toddler. Very light pushchair and folds into a manageable size. Really easy to fold up with just a simple pull of two leavers on either side. Raincover and foot muff comes as standard, with a large shopping basket underneath. 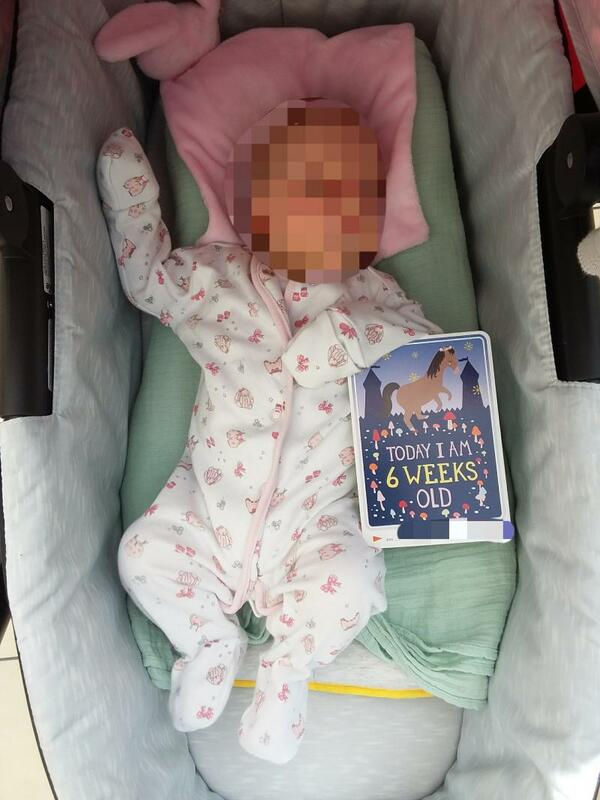 Brilliant for first time parents as everything is included and you don't need a degree to collapse or change it over. Additional bonus is that you can have it parent facing or world facing. Car seat and cot bed can easily be attached, with the travel system option and adapters included. Currently, on offer on the bounty app for an amazing price with many extras. I have mixed feeling about this pushchair, I like it because it looks good it is quite sturdy on the walks, folds down easy. What I don't like is when folded down it takes up quite a bit of space and I am not a big fan of the seat as seems like my daughter who is 20months old now is not very comfy in there and it has been like that since we bought it for her at 8 months old. Feels like she keeps sliding down and just straps holding her in and she cant relax in there unless she falls asleep and i completely lower the back of the seat. 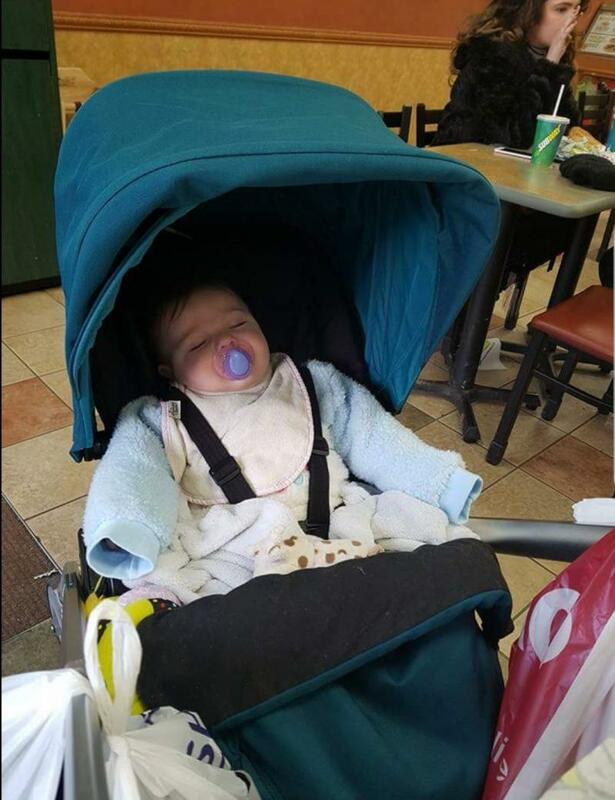 Really easy buggy to use, easily folded down, light to push, we also used it with the I-gemm car seat which was amazing and a godsend when our daughter was first born! I love this buggy. It's the easiest buggy to fold up and down, you can do it in 2 seconds. You can use the bassinet, stroller seat or car seat (with adapters) on the frame so it can be used for a long time. It's super easy to steer, the only downside is that the back wheels sit wider than the front so it's sometimes easy to think you fit through a space but you catch the back wheels. Other products that have universal adapters to fit things to buggys are difficult to use on the joie frame, they do work but not always perfectly. Eg buggy boards, parasols. very comfortable, soft and easy to clean. 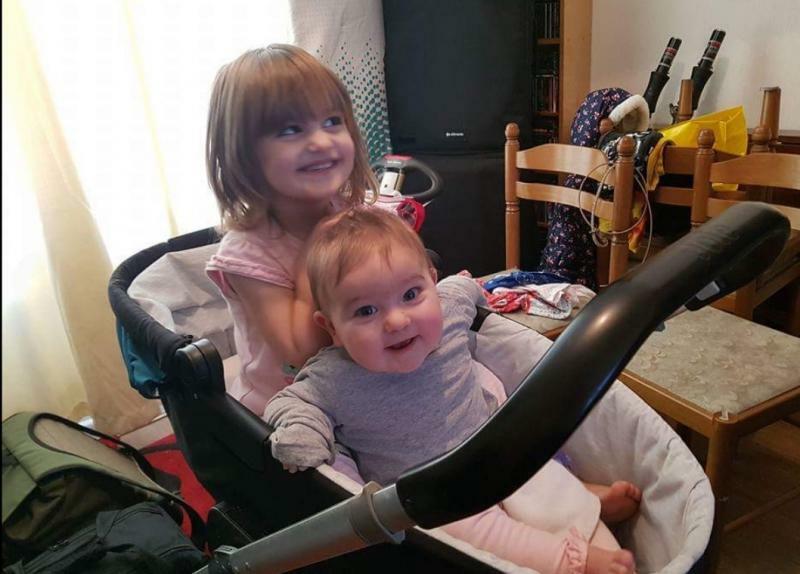 When we moved on to pushchair it was easy to place on the base and it was super easy to change it from front to rear facing. Adjustable handle was a great little feature too. 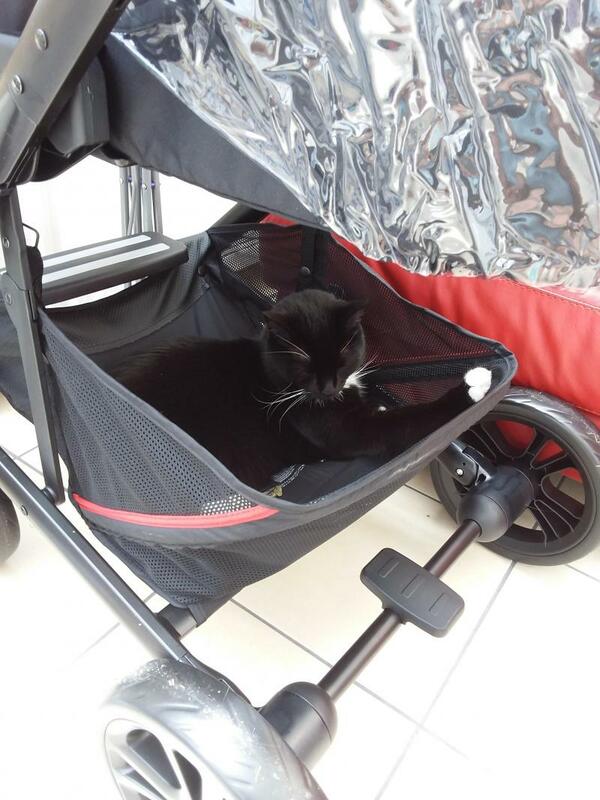 We got this pushchair on offer at half price with the carry cot and the cat seat. Easy to use. Each part is easy to switch. The car seat can be bit fiddly to remove but isn't too bad. The carry cot and chair are very simple to use. The large basket underneath is fab!! Can fit loads in it. This pushchair is easy to fold & I love how big the basket is. Me and my partner love this buggy, easy to swap around with car seat and carry cot as we brought the travel system. Lovely design for the price it’s light weight however sturdy. Big storage basket, it's cheap and easy to assemble. No suspension! Awful on almost any surface. We only used this pram (Joie Chrome) for about 2.5 months before we decided that it wasn't built for our needs. I still feel annoyed at all the good reviews it had and mostly at myself for not fully testing it (we only pushed it around the shop for a bit). The biggest issue we had with this pram is that it has zero suspension. So, in my personal humble opinion, the verdict is - unless the roads around your house are as level as the shop floor then I suggest you get another pram. As a new parent, seeing your tiny baby's head bounce at every crack in the pavement is rather distressing. After the initial spin around the block we always used it with either a regular pillow or a Cosymorpho cushion to give a bit of extra comfort. * All strap pads are not actually that padded. In conclusion - I personally wouldn't recommend this pram. Some could say that "it's a good pram for the price", but i would argue that for a very similar price you could get a much better pram/travel system (and we did!). P.S. 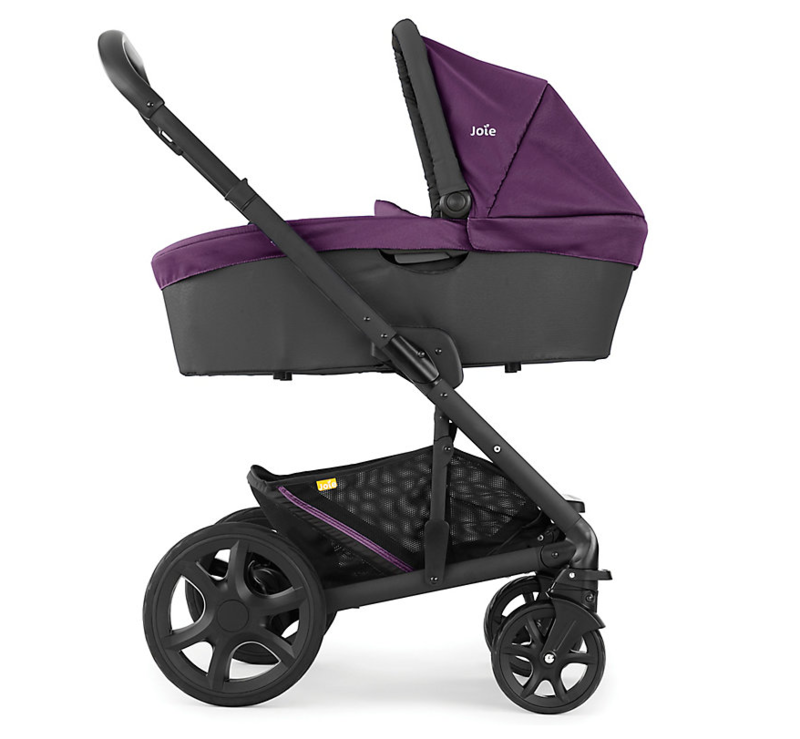 I would like to clarify that we only really used Joie Chrome with a carrycot. We "road tested" the toddler seat once, just around our block and only in full recline, as our baby girl was too young to sit up. The pushchair is light, folds easily, is comfortable for your little one and has good storage space. This pushchair is lightweight, folds easily, all wheels come off so it fit into our Nissan Micra! The car seat can slot on too. The seat can face both ways. For the price of this you really can’t go wrong. Only negatives would be that it feels a bit flimsy and the seat is quite flat which means my little one slipped down before she could sit on her own properly. I loved this pram I used it for over a year and a half with my first child. It really is built to last its sturdy and can take on nearly all terrains, the only down side is that it is a little on the heavy side its fine when just walking flat but if you constantly have to go up and down curbs you can start to feel it. Other than that I have no complaints, my little boy loved it, used from birth upwards, the colour(red) kept well and didn't fade like others do. I would recommend and buy this product again. The clasp in the harness can be fiddly and majority of people struggle to open it and fasten it. 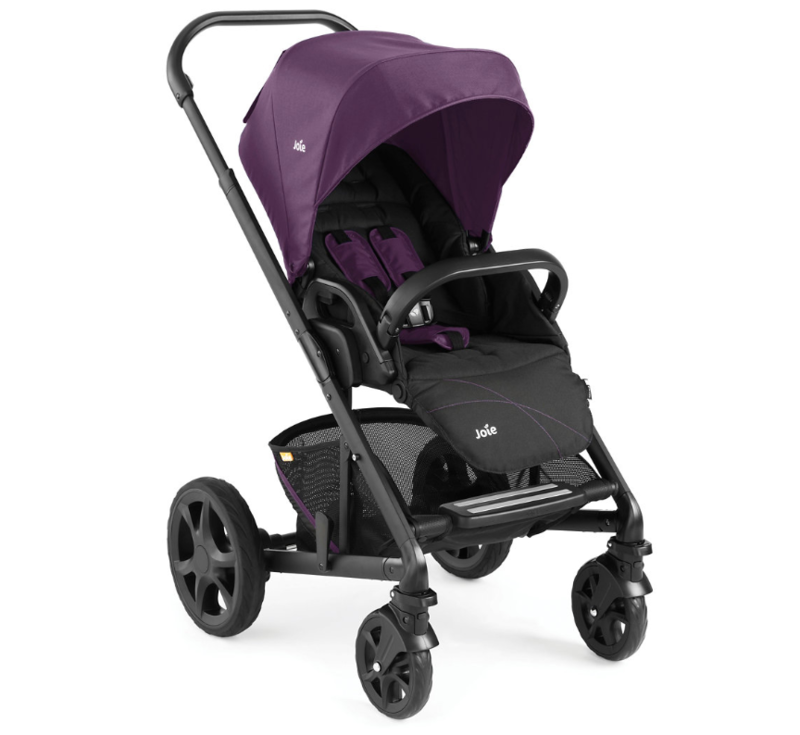 Our joie chrome travel system was brilliant, we got it in the made colour a few years ago. It stood the test of time and lasted for 2 babies. It has travelled the country with us and been bundled in and out of numerous cars. The handle is height adjustable and extremely useful when I am so short and my partner has been tall. The fact you can have the pushchair forward or rearward facing at the click of 2 buttons is lovely, especially for days out at the zoo. The pushchair rain cover is easy to put on and covers the push chair well although my children didn't like it. The material is easy to clean and the frame is very durable. The long hood makes for great protection from rain and sunshine when caught in unexpected weather and the easy recline function makes the pushchair perfect for all ages. The big back wheels pop off making storage in the car really easy, no matter how small your car and the pushchair itself is fairly light for easy storage. The large wheels give good traction off road and on sand,mud etc. Really easy to steer one handed and my kids have never had any problem falling asleep in it at any age. I sold this travel system but now am expecting my third I am looking at purchasing this again. I totally love this pram. When my baby was born I leaved on the 1st floor, I had to go up through very high, concrete stairs... But with this pram it wasn't difficult at all! I detached the carrycot, took it up, and then the wheels part. It's easy to steer with just one hand and you can turn around with one move! Baby looks comfortable there, but I think the pushchair is little bit too small. It's up to 1 year old. The amortization on the back wheels is very nice, but on front wheels I don't think there is any. It pasted me 3 years until I had no use for it and I sold it on I wish I had kept it for my second child. 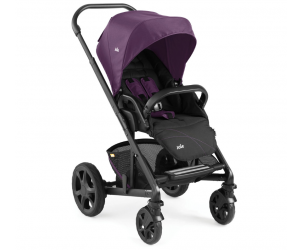 The Joie Chrome Pushchair is suitable from birth and features a reversible seat unit. The pushchair is also compatible with the Joie Gemm infant car seat (sold separately) to form a travel system, and the Joie carrycot (available separately) to create a cosy pram for newborns.